This was the playhouse I wanted. Just a simple little corner, enclosed with a couple of wooden fence panels or even latticework might do, and that old fashioned wood stove! As daughter Lynn would say, "be still my heart"!! ending somewhere back behind the old green washing machine tub, turning the corner and installing another fence panel, enclosing the playhouse. A little wood stove would fit in there somewhere. Just this week, messing around up at the greenhouse, neighbor Ann pulled over to speak. After telling her my plan, she asked, do you want some latticework? Fred just put up new, under our porch and he is taking the old to the landfill. Seriously!! Ann?? Wait a minute, she said, I'll be right back. In five minutes she was back with a stack of latticework pieces...new pieces, left over pieces. I've searched Craigslist for old wooden fence panels, but so far, nothing. It would cost way too much to buy new wooden fence panels. Good Gosh!! Okay, need to get busy this morning. There are herbs ready to plant, and okra seed for a row in the garden, and much to my surprise, the seeds I saved from those tiny pretty little red, orange, and gold peppers, from the grocery store, germinated and are big enough to put in the garden. Besides all this, I've got lots of standing and staring to do up at the long-legged tower. Any ideas or suggestions will be appreciated. I've been chopping down more saplings and small trees. A tall, neatly built wattle fence behind the playhouse would be nice. Thank you! Hope to be back here soon! "Hey! any more corn in that bucket? and hurry up, the duck is headed this way"
This rooster! He follows me around like a dog. When our neighbor Ann stops by and toots the car horn, he goes out with me to meet her and stands there while we talk. remember the 1940's Vintage apron pattern I bought recently, and used to make the heart shaped apron? don't know why this has been such a hard pattern for me to follow. Of course, you've heard me say before, I am definitely not a talented gifted seamstress...for me it's work, following these printed instructions and sewing! Sure is fun work though! Oh my, I cannot linger here long. My "to do" list is simply overwhelming. Showing the list to Poppy this morning as he walked out the door, he said, good grief, you need to get started...this was 5:25 am. P.S. I had started to reply to some comments on my last post and after a couple, the computer would not open the reply box when I clicked on it, so I gave up. Never had that happen before. Been several little things like that lately??? We got that shower of rain we needed. It started Saturday evening and stopped this morning.. Five inches it measured, in all! Stepping stones don't help much in weather like this. These are the stepping stones in dry weather..
our little rickety pier. Imagine wandering out there to sit. and this little side foot bridge that crosses the ditch that drains into the pond, was almost under water. Duck Duck says this is his kind of weather! Notice how far out in the water the iris are now? Eli said he just wanted to soak up a little of that good feeling sunshine. that big rose bush with the tiny pink boutonniere roses is in bloom. Anyhow, we needed this rain. The garden perked right up and all the beans have come through the ground. Shortly after the rain ended, I put on my old rubber boots and sloshed up to the garden to have a look. Okay, I need to sew tonight and here it is 9:00. Thank you all and I shall return. Somebody's old teddy bear needs washing. Will the roses be next? Is there a flower any prettier than an Iris? The new little herb garden is there behind the Iris patch. In the above picture, it is there between the Rosemary and the Iris. So far, German Thyme, Oregano, and mint. I cut the bottom out of an old flower pot and buried it for the mint. It is summertime hot and dry here today! Funny, we had spring in February, winter in March, and now summer in April. We really need a shower of rain...the teeny tiny garden needs rain. Why, the beans would sprout with a little moisture. After the pond was built in 1996, Poppy and I bought one water lily and one yellow water Iris. Now we have yellow Iris that spread, on their on, and bloom all the way around the pond. Very invasive!! but pretty! tiny sweet little tadpoles. There were many many more but they swam away. Do you remember holding a tadpole when you were young? I used to love catching them in a jar. Well, I am off to enjoy an hour or so in the teeny tiny sewing room. Thank you for visiting. It sure is fun looking for things to add to my little playhouse. Shoot, I just might put up curtains and a little bed and move in. Not much to see just yet, but maybe soon. I did build three tee pees from saplings, for the cucumber and squash vines. You can see a little of them over to the left. Yesterday, I tackled the hardest job yet! Let me tell you about the worst gardening mistake ever made!! a few years ago I set out ten small azaleas along the path to the shed. Then, for a border, a row of liriope or monkey grass. Oh my gosh! Was that ever a mistake! The entire row of azaleas looks like this. This is about half way down the row. What a back-breaking job! Liriope will not pull out of the ground! I've chopped and pulled, and tugged away at this mess, then added rich soil from the back of the chicken lot, then covered it with pine straw. Still have this end to go. This is one job I'm looking forward to crossing off my list! In places, we have a quarter inch of snow---ball blossoms covering the ground. One last picture. Sure hate to see it go, but what a delight this has been. Better finish up here and get busy. It is now 6:30 am...Poppy has gone to work, and I want to be in the garden by 8:30. 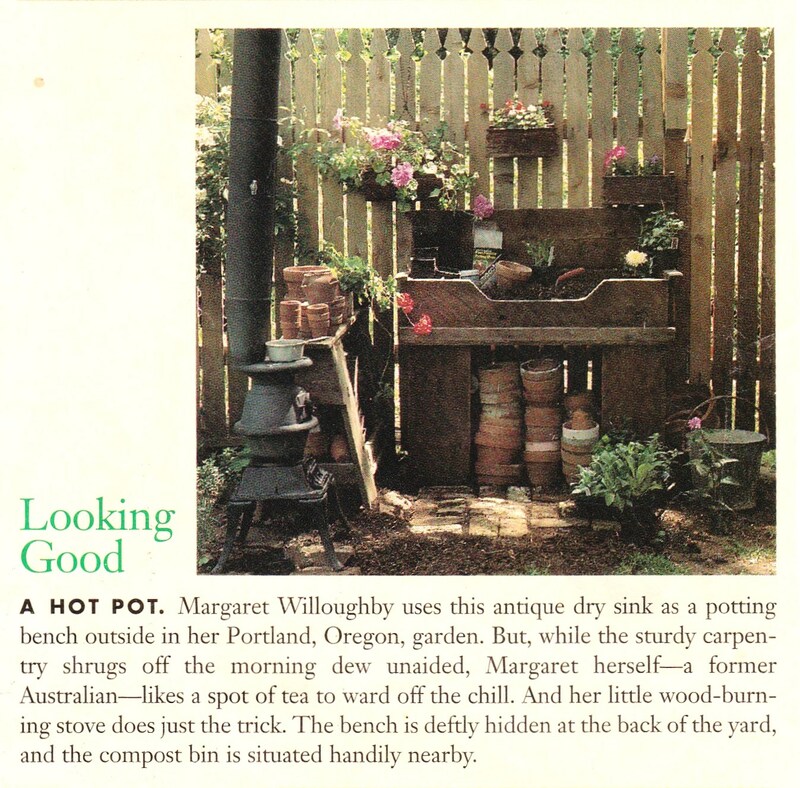 There is a good article in the May issue of Better Homes & Gardens about Russ and Marion Morash, who started the TV series, "The Victory Garden". Russ grows pole beans on 10' bamboo poles plunged 2' into the ground. I don't have bamboo poles, but there are plenty more saplings to cut. This was going to be a short quick post. :) Hope to be back soon. Eli, emptying the bird bath again. but enjoying every minute. I'll take warm weather over cold, anytime. The grass is growing and our walks around the pond grow greener with each passing day. and yellow water iris have come out. Seems like everything is pretty this spring. Isn't it funny how no one ever visits when your yard is looking good. But just let the brown dead leaves cover the yard, or have a rain and wind storm, and someone comes for a visit. So, I thank you for walking with me through the yard while the flowers are blooming. even the little wild azalea has come out. Tomorrow, hopefully, I will finish planting the garden, and add some herbs to the little herb garden. You can probably guess...here it is before daylight and I'm blogging...that's right, Poppy works today! Have you ever heard of the cute little wildflower called "Pussytoes"? We have bunches of them growing here. Well, before putting them on my blog, I googled them. Wanted to make sure they really are called "Pussytoes", and guess what! The first site that popped up was selling Pussytoes wildflower seeds. Yes, and though it hurts my heart, I've been mowing them down, but no more! I love these sweet little pussytoes. Hopefully, spring is here to stay. Every warm sunny day brings more color to our walk around the pond. Never seen the birds so busy, and the bull frogs! Why, they have started up their band again. Several play the bass drum, while a few across the pond add the twang of a bass fiddle, and just before daylight this morning, I heard the call of a Whip-poor-will!! At the edge of dark last evening, Poppy came in and said, sure wish I had carried your camera, there were two big bull frogs fighting in the edge of the water at the pond. Do bull frogs fight! It surely is spring! The perfect spot to hide a few Easter eggs. Last year a late freeze killed all the new leaves on the big Hickory tree. For now, however, the very green tender leaves sure are pretty against this blue sky. Okay, I've been sitting here way too long! Yesterday I bought herb plants for the new herb garden, and vegetable plants for the veg garden, and two packs of bulbs to go around the bird bath in front. Lots to do! Taking a minute here at the edge of dark, to post a little something. The ruffle around the apron does not have enough fullness or gathers...like the apron in the picture on the pattern. Here's the back. This apron doesn't tie at the neck, but slips over your head. anyhow, it will go in the little shop. I'm anxious to start another one. The sky was pretty late yesterday, as I was out closing the chickens up for the night. and would you believe there was a frost warning for last night! Well, there was! Again! Not much of a post here. Thank you for stopping by. Hopefully, I will return.